The top dogs versus the underdogs. The UConn Huskies will host the Quinnipiac Bobcats in an all Connecticut matchup in the second round of the NCAA Tournament. UConn is an 11-time National Champion while Quinnipiac burst onto the national stage with a run to the Sweet 16 last season. UConn head coach Geno Auriemma took notice of the other team in Connecticut that started making noise on the national stage last year. UConn beat No.16 St. Francis (PA) in the first round 140-52 which set a record for the most points scored in an NCAA Tournament games. The Bobcats know that they will have their hands full but they still need to focus on themselves. 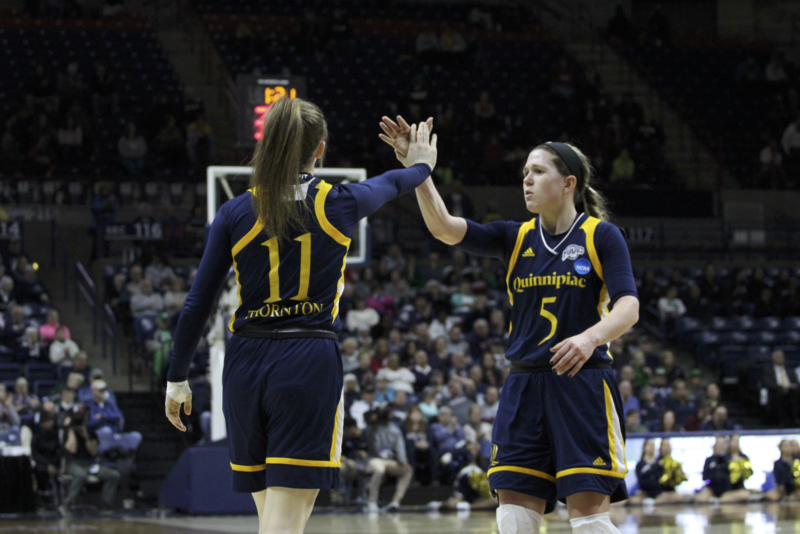 “We’re probably going to play our usual defense, how we play at Quinnipiac and do our best to cover [UConn’s] top posts,” Quinnipiac junior forward Paula Strautmane said. Quinnipiac played Miami after the UConn game so its players got to see first-hand how UConn plays and how quickly it can put up points. Despite seeing that the Bobcats know that is what is expected from the Huskies. Quinnipiac lost to the South Carolina Gamecocks in the Sweet 16 last season and Quinnipiac is once again excited to play the model program in women’s college basketball. The Bobcats look forward to the challenge of trying to beat the best team. The thing that makes Quinnipiac so difficult to beat is its depth and how it is so good at executing on the offensive and defensive ends of the floor. UConn knows that beating Quinnipiac will not be easy. No.9 Quinnipiac will tip-off against No. 1 UConn at 6:30 p.m. at Gampel Pavilion in Storrs, Conn. Be sure to follow @QBSN, @joshmsilverman and @shanedennehy15 for updates throughout the game as well as postgame content.